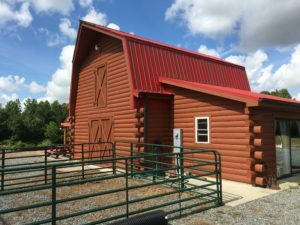 The Cherry’s barn where products are made and sold. Photo courtesy of M. Dinan. Farming in North Carolina involves more than our important fruits, vegetables, and common livestock. Ken and Lori Cherry, participating farmers in the Fork to Farmer Initiative, not only grow the gamut of crops, but also contribute to a burgeoning industry in North Carolina. This industry? Quality fibers. 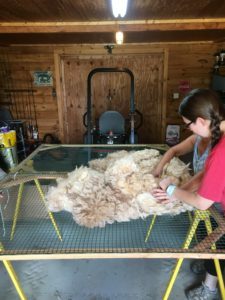 Their operation, Alpacas at Cherry Run, LLC, includes the breeding and raising of alpacas whose fleece lacks the itch and scratch of most wools. Originally motivated to raise sheep, Lori quickly fell in love with alpacas for their vibrant personalities. She demonstrates this connection with her animals in her farm operations. While many farmers either breed or raise, Lori does both. She sees value in being a part of the entire process, developing relationships with the alpacas and overseeing quality control. The process continues through the annual shear in April to the processing of fleece into a variety of products sold year round. 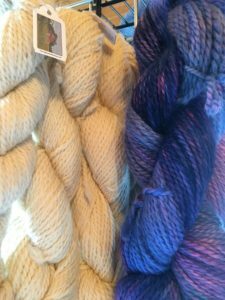 While all parts of an alpaca’s fleece are usable, Lori offers spun yarn, felt, and dryer balls, among many other crafts and accessories. With alpaca importation into the United States occurring only 25 years ago, alpaca farming is a relatively new endeavor in this country. Lori, a member of Carolina Alpaca Breeders and Owners as well as the Alpaca Owners Association, works diligently with others to educate on alternative livestock operations and promote opportunities in the fiber industry. Lori conducts farms tours, offers classes to learn about and participate in alpaca care, and provides boarding for individuals who are not yet equipped for alpacas on their property. Her 18 alpacas have solar powered fans, full grazing rights and free-choice hay, and excel in alpaca shows. While her alpacas are well cared for, Lori welcomes volunteers and questions. She hopes for a rise in knowledgeable and dedicated individuals in alternative livestock agriculture, medicine, and extension. For more information on opportunities, classes, or farm visits, visit their website. Examples of quality products sold on property, complete with information on the contributing alpaca. Photo courtesy of M. Dinan. An alpaca fleece ready for roving, or removal of debris. Next step: spinning! Photo courtesy of M. Dinan.